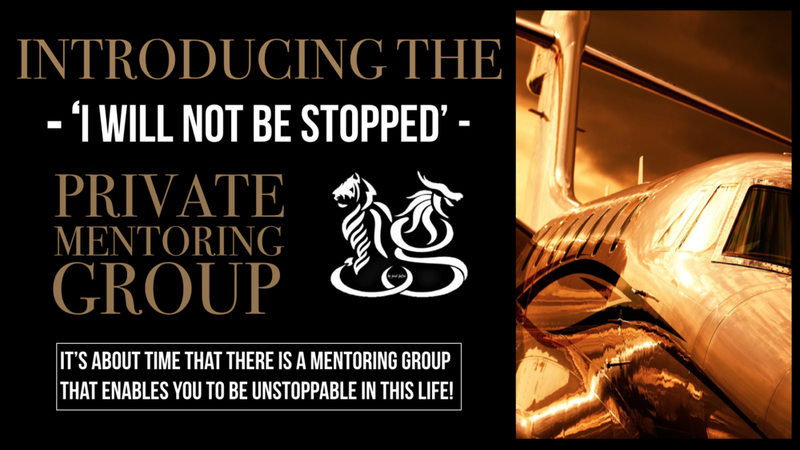 PRIVATE MENTORING GROUP — "#corporatewarrior"
Welcome to the I WILL NOT BE STOPPED Private Mentoring Group. In today’s world; more than ever; leaders and individuals need to connect and engage with their ASSOCIATES. I WILL NOT BE STOPPED believes in the power and influence of the individual and their ability to impact their life and the world for the better. Our exclusive Private Mentoring Group specialises in delivering an intimate leadership program designed specifically for human transformational change. Our program provides the nurturing, focus and clarity that individuals require in order to transform the ordinary into extraordinary. We provide a luxurious, secure environment with a hand-picked group of like-minded peers who guide and support you through your journey toward game-changing greatness. THIS GROUP WILL ACTIVATE, MOTIVATE & EDUCATE YOU! SO WHICH POWERFUL, ELITE GROUP DO YOU BELONG TO?